Its mermay and its time. 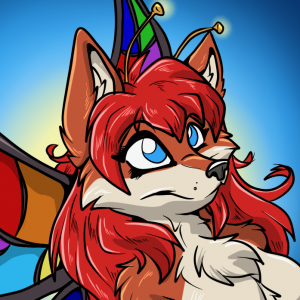 Me in merfox form. I see people complaining about tumblrkin, and how we need to “get rid of the bad members of our community”, but I rarely see these fabled beings. Are they real, or just glorified strawmen? They are very real, but they’re in no way ‘bad members’ or malicious. They’re misinformed, perhaps a bit naïve, and, more often than not, new to the community. Fluffy ‘kin deserve all the same respect and decency with which you would treat any other person. But we also owe it to the rest of the community to give them a kind (if sometimes stern) explanation of what they might’ve misunderstood about otherkinity and how this all works. Pushing people away from perhaps the only community they can fully relate to helps absolutely no one, but neither does ignoring fluff. It’s about finding the balance between acceptance and education. 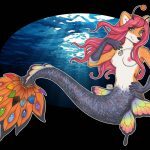 I would have to say that it is actually a mix of trolls being so prevalent on tumblr (making thousands of kin blogs with designer genders and pronouns and dozens of kintypes) that they are defining otherkin for a generation, and then the legit kin out there who see only these examples on tumblr and running with it. 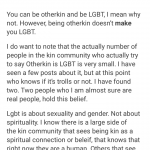 It’s making being otherkin very difficult right now.